There are many great spots to cozy up in El Dorado County for Valentine's Day or anytime. Check out bed & breakfasts in historic towns or venture off the beaten path. El Dorado County is one of the most diverse, beautiful places you’ll ever visit. Sierra scenery is nothing short of spectacular, spanning across more than 1800 square miles with elevations ranging from just a few feet to more than 10,000 feet above sea level. The 1848 discovery of gold in Coloma touched off the largest gold rush in history. Today we are much more than rustic mining towns and historic sites. We are a year-round vacation destination overflowing with outdoor adventure, a welcoming wine and agricultural scene, enriching family activities, and a proud Gold Rush history. Spring is a time of renewal and possibility. Longer days, warmer weather and the changing season promise new adventures. In El Dorado County, you’ll find the best of all worlds, with snow still abundant in the high country, and spring flowers, warm temps, and budding vines in the foothills. Looking for ways to make the most of your spring? Our spring activities guide can help. They say that April showers bring May flowers. In El Dorado County, wildflowers begin to bloom anytime between late March in the foothills to June/July in the high country, depending on winter snows. That means you’ve got a wide window of opportunity to enjoy Mother Nature’s fireworks. 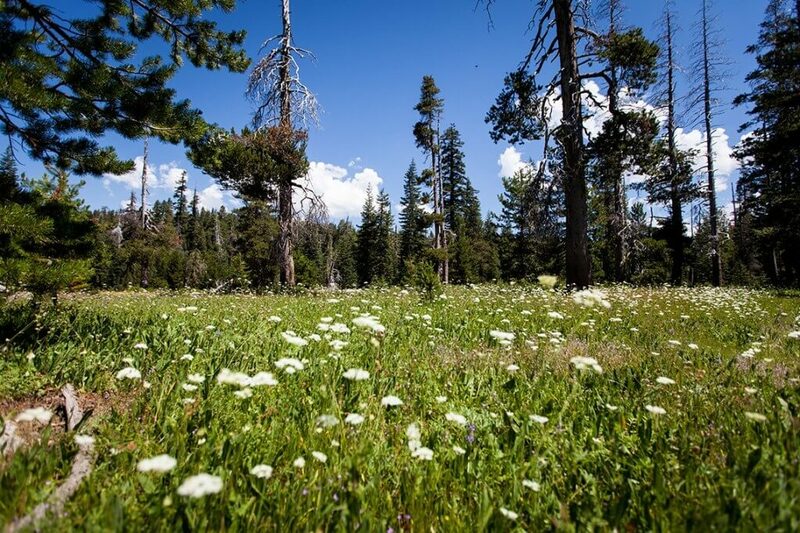 Check out our recommendations for the best places for wildflower spotting in El Dorado County. How Can Hiking Become a Spiritual Experience? There is a vast expanse of research out there that is testament to the physical benefits of hiking. Improved muscle strength, reduced risk of heart diseases, and enhanced respiratory fitness are only some of how hiking is good for us. Hiking makes you a stronger person. Climbing over uneven surfaces, jumping over rocks, and navigating your way around trees and across rivers and streams indeed provide a holistic fitness session for your body. However, did you know that hiking can also be beneficial for you spiritually and emotionally? If you’re feeling like you’re losing yourself and need to reconnect, you may want to try hiking. It makes sense for skiers and snowboarders to embrace snow, but hikers? This winter’s significant snowfall is great news for those of us who enjoy the sight of fast moving rivers and abundant waterfalls. And since some these hikes are easy to moderate, they’re a great family-friendly activity as well. What a winter we had! Mother Nature packed a winter wallop that we haven’t seen in a while. Some nearby ski resorts have announced they will stay open until July thanks to the record-breaking snowfall in the mountains. Streams, rivers, and lakes are full, waterfalls and wildflowers are going crazy, and the rolling hills are lush and green again. There has never been a better time to enjoy the great outdoors in El Dorado. We’ve put together some of our most popular pastimes following a wild and wet winter. Whether you’re a seasoned rafter seeking whitewater thrills or have never been on a river rafting trip, you can find a variety of adventures available through the many river rafting and kayak operators. El Dorado County is home to the South Fork of the American River, the West Coast’s most popular whitewater river, offering intermediate (Class III) adventures along the backdrop of Gold Rush history. The Mother Lode of the California Gold Rush ran straight through El Dorado County bringing in miners from all over the world to strike it rich. Every Sunday, 10 AM - 1:00 PM.\r\n\r\nThe El Dorado Western Railroad, a living history program of the El Dorado County Historical Museum, offers rides on restored Fairmont track inspection cars every Sunday, 10AM - 1:00PM, weather permitting, with the last ride departing at 2:30PM. The rides depart on the 1st and 3rd Sundays from the El Dorado Station, located on Oriental Street in El Dorado. Rides depart on the 2nd and 4th Sundays from the Shingle Springs Depot, located at 4241 Mother Lode Dr. Call (530) 409-8473 for departure times. The rides are round trip, take about 30-40 minutes, and a donation of $5 per person is requested (ages 9 and up)<\/p><\/div>","
The observatory is open to the public on weekend evenings (weather permitting), Folsom Lake College, El Dorado Center, 6699 Campus Drive, continue through the back parking lots to the left of the observatory gate.<\/p><\/p><\/div>","
Second Tuesday of the month is Big Money Bingo, and the buy-in is $12. Location: Community room in the El Dorado Hills Library, 7455 Silva Valley Parkway, El Dorado Hills<\/p><\/div>","
Visitors are always welcome, so come join us any time.<\/p><\/div>","
El Dorado County is a great place to travel with your dog. Tag #eldoradocounty on Instagram and we’ll share our favorites!